Reb Eliezer Lipa was a simple but devout Jew who lived in the town of Tarnow in Galicia. He was not well versed in Torah and didn’t know the meaning of most of his daily prayers, but he always prayed with the minyan (prayer quorum) and was scrupulous to say all the proper responses to the prayer leader. He never conversed about worldly matters in the shul (synagogue), and he accorded the Torah scholars and rabbi their due honor. Reb Eliezer Lipa was a laborer who knew many trades, but he was most well known as a water-carrier. He worked hard, and managed to make a decent living, as he had four steady customers who were well-to-do merchants and who paid him above the average rate for his services. One day, Rabbi Israel Baal Shem Tov arrived in Tarnow. This was before the chassidic master had revealed himself to the world, and he appeared as a simple itinerant, but with a gift for telling stories. He used to congregate with the other laborers and tell them stories from the Talmud. He would also speak to them about how much G‑d was pleased with the sincere prayers and straightforward faith of ordinary Jews. Reb Eliezer Lipa was guiding his wagon with its full barrel of water through the center of town, when he spotted his friend and fellow water-carrier Reb Zalman Dov along with some other men, gathered around a simply dressed itinerant and listening intently with heads inclined to catch his every word. 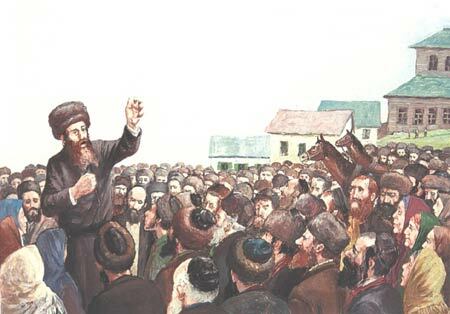 His interest sparked, Reb Eliezer Lipa went over to join the circle of listeners. The Baal Shem Tov was telling the story related in the Talmud of a wealthy man who lived in the days when the Holy Temple in Jerusalem still stood. “The wealthy man was taking a fattened ox to the Temple for a sacrifice. It was a massive beast, and when it decided, for reasons of its own, to stop still in its tracks, nobody was able to convince it to walk further towards their destination. No amount of pushing and prodding could make that animal budge. “A poor man who was on his way home was watching the scene. In his hand was a bunch of freshly picked greens. These he now held to the muzzle of the ox, and when the animal began to nibble, he drew them away and thereby led the animal to its destination at the Holy Temple. “The wealthy man brought a large fattened ox for a burnt-offering. He was so joyful at being able to bring such an animal that he also brought a sheep for a peace-offering and made a huge feast for his family and friends. He also distributed the proper gifts from his sacrifices to the priests. His joy was so intense that he held back nothing. The poor man, on the other hand, had only a bunch of greens to bring home for his family. What were his few stalks compared to the fattened animal of the wealthy man? Reb Eliezer Lipa’s mind knew no rest. How he longed to be able to do a mitzvah like the poor man in the story, with pure intention and a joyful overflowing heart! The weeks passed and still Reb Eliezer Lipa knew no peace, as his heart ached with the desire to be able to do such a mitzvah. One day, as Reb Eliezer Lipa was delivering water to one of his wealthy customers, he had an idea, an idea so perfect that his whole being became flushed with a great sense of pleasure and relief. Reb Eliezer Lipa’s four wealthy customers provided him with half of his livelihood, since they paid him far more than the going rate for a barrel of water. On the other hand, his friend Reb Zalman Dov supplied the town’s four synagogues, which paid him half-price for their water. “I can exchange four of my customers for four of his,” thought Reb Eliezer Lipa. “Four wealthy homes for four synagogues.” He was anxious to serve G‑d by providing the water that the congregants would wash their hands with. Certainly the mitzvah was of more value than the profits he would give up. He went home and told his wife about the story he heard from the visiting storyteller, and how doing a mitzvah with joy is like bringing a sacrifice in the Holy Temple, even though it no longer stands. His wife readily agreed to the idea, as did Reb Zalman Dov, who sorely needed the extra income. The deal was struck and the exchange of customers was made. No one but Reb Eliezer Lipa and his wife knew what had happened, and they were overjoyed at the prospects for their new “business.” There were days when Reb Eliezer Lipa’s wife went to the river to participate in the mitzvah of drawing the water for the synagogues. As they hauled the water, they would concentrate on the mitzvah of preparing the water for the congregants to wash their hands with before prayers, and their joy was boundless. For they understood that G‑d desires the heart. Amongst chassidim there is a tradition that it was in the merit of their mitzvah, Reb Eliezer Lipa and his wife were blessed with children, for she had formerly been barren. They gave birth to two sons, who grew to be luminaries who lit up the Jewish world and inspired tens of thousands to return to G‑d and to serve Him with joy: Rabbi Elimelech of Lizhensk and Rabbi Zusha of Anipoli, two of the most illustrious disciples of the Baal Shem Tov’s successor, Reb DovBer, the Maggid of Mezeritch. Great Story Chassidic stories are always so inspiring. Thank you chabad.org for making great stories like this available to everybody! made me tingle this story gave me tingles down my spine. such earnestness! such sincerety!